Pecan Pie is one of those friendly foods that doesn’t usually have milk anywhere other than the crust (and even then, you can avoid it). And since the chocolate is bittersweet, as long as you buy good chocolate, you’re good there too. The first time I made this, I used juuust enough chocolate to cover the bottom of the pie. This time I upped that… Now, it was chocolaty-er. On the other hand, it was also harder to cut after it had cooled. It wasn’t impossible to cut, and if it were for some sort of holiday, it wouldn’t be around long enough to fully cool…. But keep that in mind if you want to tweak the amount of chocolate. At some point I want to try toasting the pecans in bourbon first. Melt chocolate in a metal bowl set over barely simmering water, stirring. Remove from heat. Or microwave it– 30 seconds, stir, repeat until spreadable. Do whatever it is you do with pie crust. Make it, pull it out of the freezer…. make someone else make it for you and ship it to you from Chicago…. It’s all good. Whisk together eggs, brown sugar, vanilla, and salt in a bowl, then whisk in corn syrup and pour over pecans. Bake pie until filling is puffed and crust is golden, 50 to 60 minutes. (If pie is browning too fast after 30 minutes, loosely cover with foil.) Cool pie on a rack to warm or room temperature. 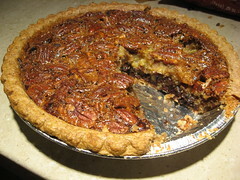 oh man, is there anything in this world more decadent than pecan pie?